In this chapter, Maldonado analyses the current higher education policy agendas of two key influential international organisations: the World Bank (WB) and the Organisation for Economic Cooperation and Development (OECD). The main issues discussed are the role of skills and competences and the expansion of higher education markets through some financial decisions of the organisations that can borrow/lend money, especially the International Financial Corporation (IFC) (a World Bank institution). 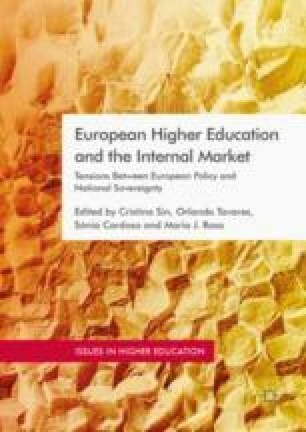 While the higher education sector is in the middle of ideological, political and economic storms, it will certainly continue to be relevant for the future of most countries; therefore, assessing critically the role of the WB and the OECD is necessary as part of the understanding of what is defined as the global governance of higher education. The author appreciates the assistance of Nicte-Há Dzib Soto for collecting and processing the information regarding the World Bank and the IFC. Also, the editing and comments of some anonymous colleagues. African Development Bank—AfDB. (2016). The African Development Bank Group—Premier Supranational Development Institution for Africa. Retrieved from http://www.afdb.org/fileadmin/uploads/afdb/Documents/Financial-Information/AfDB_financial_overview_-_2016.pdf. Ananiadou, K., & Claro, M. (2009). 21st Century Skills and Competences for New Millennium Learners in OECD Countries (OECD Education Working Papers, 41). OECD Publishing. http://dx.doi.org/10.1787/218525261154. Retrieved from http://www.oecd.org/officialdocuments/publicdisplaydocumentpdf/?cote=EDU/WKP(2009)20&doclanguage=en. Asian Development Bank—AsDB. (2016). Annual Report 2015. Reviewed on December 16. Retrieved from https://www.adb.org/sites/default/files/institutional-document/182852/od-appendix5.pdf. Fazackerley, A., & Worthington, P. (2007). British Universities in China: The Reality Beyond the Rhetoric (Agora Discussion Paper). Agora: The Forum for Culture and Education. Retrieved from https://academiccouncil.duke.edu/sites/default/files/u6/AC-pdfs/09-10/11-19-09/Agora-China-Report1.pdf. Glass, A. (Ed.). (2014). The State of Higher Education 2014. Paris: OECD Higher Education Programme (IMHE). Retrieved from https://www.oecd.org/edu/imhe/stateofhighereducation2014.htm. Inter-American Development Bank—IDB. (2016). Annual Report 2015. Retrieved from https://publications.iadb.org/bitstream/handle/11319/7554/IDB-Annual-Report-2015-The-Year-in-Review.pdf?sequence=5. International Finance Corporation—IFC. (2001). The IFC Difference. 2001 Annual Report. Washington, DC: IFC. Retrieved from http://www.ifc.org/wps/wcm/connect/publications_ext_content/ifc_external_publication_site/publications_listing_page/annual+report+2001. International Finance Corporation—IFC. (2002). Investing a Sustainable Private Sector. 2002 Annual Report. Washington, DC: IFC. Retrieved from http://www.ifc.org/wps/wcm/connect/publications_ext_content/ifc_external_publication_site/publications_listing_page/annual+report+2002. International Finance Corporation—IFC. (2003). Innovation, Impact, Sustainability. IFC’s Commitment. 2003 Annual Report. Washington, DC: IFC. Retrieved from http://www.ifc.org/wps/wcm/connect/publications_ext_content/ifc_external_publication_site/publications_listing_page/annual+report+2003. International Finance Corporation—IFC. (2004). Adding Value to Private Sector Investment. 2004 Annual Report. Washington, DC: IFC. Retrieved from http://www.ifc.org/wps/wcm/connect/publications_ext_content/ifc_external_publication_site/publications_listing_page/annual+report+2004. International Finance Corporation—IFC. (2005). Investing in Progress with Experience, Innovation and Partnership. 2005 Annual Report. Washington, DC: IFC. Retrieved from http://www.ifc.org/wps/wcm/connect/publications_ext_content/ifc_external_publication_site/publications_listing_page/annual+report+2005. International Finance Corporation—IFC. (2006). Increasing Impact. The Year in Review 2006. Washington, DC: IFC. Retrieved from http://www.ifc.org/wps/wcm/connect/publications_ext_content/ifc_external_publication_site/publications_listing_page/annual+report+2006. International Finance Corporation—IFC. (2007). Creating Opportunity. IFC 2007. Washington, DC: IFC. Retrieved from http://www.ifc.org/wps/wcm/connect/publications_ext_content/ifc_external_publication_site/publications_listing_page/annual+report+2007. International Finance Corporation—IFC. (2008). Creating Opportunity. 2008 Annual Report. Washington, DC: IFC. Retrieved from http://www.ifc.org/wps/wcm/connect/publications_ext_content/ifc_external_publication_site/publications_listing_page/annual+report+2008. International Finance Corporation—IFC. (2009). Their/Our Story. Creating Opportunity Where It’s Needed Most. IFC 2009 Annual Report. Washington, DC: IFC. Retrieved from http://www.ifc.org/wps/wcm/connect/publications_ext_content/ifc_external_publication_site/publications_listing_page/annual+report+2009. International Finance Corporation—IFC. (2010b). Where Innovation Meets Impact. IFC Annual Report 2010. Washington, DC: IFC. Retrieved from http://www.ifc.org/wps/wcm/connect/publications_ext_content/ifc_external_publication_site/publications_listing_page/2010+printed+report+default+content. International Finance Corporation—IFC. (2011). I Am Opportunity. IFC Annual Report 2011. Washington, DC: IFC. Retrieved from http://www.ifc.org/wps/wcm/connect/publications_ext_content/ifc_external_publication_site/publications_listing_page/ar2011. International Finance Corporation—IFC. (2012). Impact. Annual Report 2012. Washington, DC: IFC. Retrieved from http://www.ifc.org/wps/wcm/connect/publications_ext_content/ifc_external_publication_site/publications_listing_page/ar2012. International Finance Corporation—IFC. (2013). The Power of Partnerships. Annual Report 2013. Washington, DC: IFC. Retrieved from http://www.ifc.org/wps/wcm/connect/publications_ext_content/ifc_external_publication_site/publications_listing_page/ar2013. International Finance Corporation—IFC. (2014). Big Challenges. Big Solutions. IFC Annual Report 2014. Washington, DC: IFC. Retrieved from http://www.ifc.org/wps/wcm/connect/publications_ext_content/ifc_external_publication_site/publications_listing_page/ar2014. International Finance Corporation—IFC. (2015). Opportunity, Capital, Growth, Impact. IFC Annual Report 2015. Washington, DC: IFC. Retrieved from http://www.ifc.org/wps/wcm/connect/corp_ext_content/ifc_external_corporate_site/annual+report+2015/2015+online+report/printed+version/printed+version. International Finance Corporation—IFC. (2016). Annual Report 2016. Experience Matters. Washington, DC: IFC. Retrieved from http://www.ifc.org/wps/wcm/connect/corp_ext_content/ifc_external_corporate_site/annual+report+2016/2016+online+report/printed+version/printed+version. International Finance Corporation—IFC. (2017a). Annual Report 2017. Creating Markets. Washington, DC: IFC. Retrieved from http://www.ifc.org/wps/wcm/connect/CORP_EXT_Content/IFC_External_Corporate_Site/Annual+Report/. International Finance Corporation—IFC. (2017b). Official Website. Retrieved from http://www.ifc.org/wps/wcm/connect/corp_ext_content/ifc_external_corporate_site/about+ifc_new. Kilar, S. (2013, January 23). World Bank Invests in Baltimore-Based Laureate Education. Equity Investment Is a Less Than 5 Percent Stake in Company. The Baltimore SunNewspaper. Retrieved from http://articles.baltimoresun.com/2013-01-23/business/bs-bz-laureate-education-20130123_1_ifc-laureate-education-laureate-international-universities. Laureate (2016). Mission. Laureate International Universities. Retrieved from http://www.laureate.net/AboutLaureate/Mission. Mudde, C. (2017). What the Stunning Success of AfD Means for Germany and Europe. The Guardian. Retrieved from https://www.theguardian.com/commentisfree/2017/sep/24/germany-elections-afd-europe-immigration-merkel-radical-right. Olssen, M., & Peters, M. A. (2007). Neoliberalism, Higher Education and the Knowledge Economy: From the Free Market to Knowledge Capitalism. Journal of Education Policy, 20(3), 313–345. Retrieved from http://www.tandfonline.com/doi/abs/10.1080/02680930500108718. Organisation for Economic Co-operation and Development—OECD. (2016a, June 17). Benchmarking Higher Education System Performance Background Paper. Presented at OECD Higher Education Stake Holder Forum. Retrieved from: http://www.oecd.org/edu/skills-beyond-school/Benchmarking%20Background%20Paper%20FINAL.pdf. Organisation for Economic Co-operation and Development—OECD. (2016b). Budget Committee. Financial Statements of the Organization for Economic Co-operation and Development as at 31 December 2015. BC (2016)20. JT03398607. Retrieved from: http://www.oecd.org/officialdocuments/publicdisplaydocumentpdf/?cote=BC(2016)20&docLanguage=en. Organisation for Economic Co-operation and Development—OECD. (2016c) PIAAC. Reviewed on October 1. Retrieved from http://www.oecd.org/skills/piaac/aboutpiaac.htm. Organisation for Economic Co-operation and Development—OECD. (2016d). PISA. Reviewed on October 1. Retrieved from https://www.oecd.org/pisa/aboutpisa/. Organisation for Economic Co-operation and Development—OECD. (2016e). Skills Matter: Further Results from the Survey of Adult Skills. OECD Skills Studies. Paris: OECD. Retrieved from http://dx.doi.org/10.1787/9789264258051-en. Organisation for Economic Co-operation and Development—OECD. (2017). AHELO Main Study. Reviewed on November 2. Retrieved from http://www.oecd.org/edu/skills-beyond-school/ahelo-main-study.htm. Pasha-Robinson, L. (2016). Marine Le Pen Takes Huge Lead Over Nicolas Sarkozy in French First Round Presidential Election Poll. Reviewed on December 6. Retrieved from http://www.independent.co.uk/news/world/europe/marine-le-pen-poll-election-odds-latest-french-presidential-lead-sarkozy-a7428126.html. Runde, D. (2016, June 17). International Youth Foundation and Laureate Education Solve Important Global Problems. Forbes. Retrieved from http://www.forbes.com/sites/danielrunde/2016/06/17/international-youth-foundation-laureate-education-solve-important-global-problems/#562edd1e1ffe. Schultheis, E. (2017). Marine Le Pen’s Real Victory. The Atlantic. Retrieved from https://www.theatlantic.com/international/archive/2017/05/le-pen-national-front-macron-france-election/525759/. Stephens, P. (2016). The Trumpian Threat to the Global Order. The Financial Times. Retrieved from https://www.ft.com/content/3f16e476-7e5c-11e6-8e50-8ec15fb462f4#ixzz4L3Ax7300. United Nations Educational, Scientific and Cultural Organization—UNESCO. (2014). Programa y presupuesto aprobados 2014–2017. Paris: UNESCO. Retrieved from http://unesdoc.unesco.org/images/0022/002266/226695s.pdf. World Bank. (2011). Learning for All. Investing in People’s Knowledge and Skills to Promote Development. Washington, DC: World Bank. Reviewed on October 2. Retrieved from http://siteresources.worldbank.org/EDUCATION/Resources/ESSU/Education_Strategy_4_12_2011.pdf. World Bank. (2014a). Annual Report 2014. Retrieved from https://openknowledge.worldbank.org/handle/10986/20093. World Bank. (2015). Annual Report 2015. Washington, DC: The World Bank. Retrieved from https://openknowledge.worldbank.org/handle/10986/22550. World Bank. (2016a). Annual Report 2016. Washington, DC: The World Bank. Retrieved from http://www.worldbank.org/en/about/annual-report. World Bank. (2016b). World Bank Group Finances. Retrieved from https://finances.worldbank.org/Projects/IFC-Investment-Services-Projects/efin-cagm. World Bank. (2018). Learning to Realize Education’s Promise (A World Bank Group Flagship Report 2018). Washington, DC: The World Bank. Retrieved from http://www.worldbank.org/en/publication/wdr2018. World Trade Organisation—WTO. (2016). World Trade Statistical Review 2016. Retrieved from https://www.wto.org/english/res_e/statis_e/wts2016_e/wts2016_e.pdf. Yerevan Communiqué. (2015, May 14–15). Yerevan Communiqué. Conference of Ministers Responsible for Higher Education, Yerevan. Retrieved from http://www.ehea.info/cid101764/ministerial-conference-yerevan-2015.html.